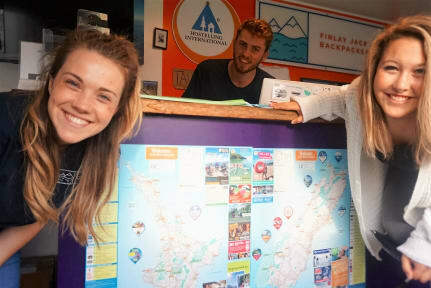 Finlay Jacks backpacker’s is a fresh modern hostel with Free unlimited WiFi, Netflix, Tea & Coffee, spacious balcony, cozy TV lounge, well equipped kitchen, plenty of off street parking and the friendliest staff around. A hostel that revolves around our guests and ensuring that their stay is comfortable and enjoyable. We like to think of ourselves as a fresh young hostel keeping up with the young generation of today offering things such as single beds, en suites attached to the rooms, free quality WiFi and Netflix for those quiet nights. Our office hours are 8am - 8pm. As instalações do hostel são super novas, banheiro e cozinha sempre limpos, camas confortáveis, possuem armário para guardar a mochila, free WiFi. O único problema é a distribuição das tomadas, pois quando alguém usa um adaptador ele acaba ocupando o espaço de duas tomadas.